This handsome rifle is owned by Oregon’s Jason Bingham, a school-teacher by trade. Jason writes: “Here’s my old 300/600 yard competition rifle, smithed by Bob Wolcott and myself. Sad to say, this rifle is now owned by another gentleman in Oregon, but I am very proud of how this project came together. It features a short Rem 700 action that has been thoroughly prep’d for competition. The stainless barrel is a 29″ 3-groove Pac-Nor Supermatch with a 1:8″ twist, anchored in a Shehane Thumbhole Tracker stock. The gun consistently shot .300” groups at 200 yards. My load is 105gr JLKs at 2715 fps with single-digit ES & SD. This particular 6BR project started out of childish jealousy towards two local shooters who were shooting standard-case 6BRs at local 300/600 yard matches. One of them was using a 1:10″ twist based on a Searcy action and the other a 1:8″ twist on a Nesika Bay “J” action. Both of these rifles were always competing for the top two places in the local, monthly shoots. That was it, I had just completed and sold my latest bench gun project, a 6.5-284 Shehane, and decided I wanted a piece of the 6BR pie. That very day when I got home I started researching components for my future rifle. 6BRs were showing up in all of the F-class match reports around the country and in reviewing my old P.S. Magazines I came across J.J. Conway’s “Winning with a 6BR and a Big .224”, (Precision Shooting, June 2000). J.J.’s article sealed the deal. I started to put together my wish list of ideal components: BAT action, Jewell trigger, Pac-Nor Supermatch stainless barrel, Shehane Tracker stock, Kelbly-style tapered base, and Jewell scope rings. I forgot to mention earlier my vice, or should I say obsession, with building rifles, getting them to shoot really well, and then selling them off to finance yet another. This may have something to do with my engineering background in college before I signed up as an elementary school teacher, but who really knows? Anyway, as I rang up the costs for all of the components, I saw a dollar figure that was going to force me to commit a felony or two in order to see this project through. Something had to be done to bring the total cost down. Again, after looking at many match reports from F-Class, IBS, NBRSA, and Williamsport long range shoots I decided I could live with an accurized Remington 700 short action. Divine intervention shined upon me as I met with Bob Wolcott and found out he did his own metal work on his rifles. One of his rifles was in the hunt for first place each match. Bob mentioned he had some new ideas he wanted to try out and he would do all of the metalwork for a bargain price, if I was willing to allow my rifle to be a test-bed. I’m a gripper, not a free recoiler. I like to make sure I am in control of the rifle at all times whether shooting from a bench or the ground. I shot my 6BR for the last half of the 2002 season, three matches in all, and won every match. During the final match of the season, October 6th, I shot a new Range Record. Two days went by and Bob emailed over his proposed action mods. His list had all of the accepted accurizing techniques like chasing threads, lug surface contact, and so on but this is where it got fun. Bob wanted to bush the bolt body in a way similar, but still different, to the Bordon Bumps used on Nesika actions, bush the bolt face and reopen it to a smaller diameter, turn the firing pin down to match the new firing pin hole, and finally add a Sako extractor and BAT made Remington 700 bolt handle. All of these are well-known accurizing techniques but they are seldom done on a Rem 700 action because of the labor and cost involved. Looking at all these mods I thought to myself, “I might as well go with a custom action, this is going to cost a fortune!” But then I saw the actual price at the bottom of the Bob’s email and my jaw hit the floor. This was one of those once in a lifetime deals. The total price was so reasonable, I had to go for it. After all of the major components had arrived it took about a week and all of the metalwork was complete. Needless to say Bob does top-notch work and it shows in his attention to detail (You have got to love engineers). Everything functioned flawlessly and the bolt/action clearance was exactly like Bob had said it would be; no movement whatsoever with the bolt closed yet loose as a goose when open. The bolt face looked like one complete insert inside of the bolt face yet in actuality it is two pieces with a very tiny firing pin hole dead center. I have heard my father many times say, “It is all in the details!”, and this rifle is a perfect example of that. The bolt shroud I had purchased for the rifle had a matte silver finish that didn’t match the finish on the BAT bolt handle. So Bob got out the handy bead blaster and blasted the surfaces until they matched as closely as possible, then he did the same for the Jewell rings and Davidson bases. I call Bill Shehane, “The Man” when it comes to 1000-yard laminated stocks, and his Tracker series was the obvious stock choice for me. I’ve owned other Trackers and they always worked well. As the name suggests, these stocks ride the bags incredibly well, and I’ve found the thumbhole design to be comfortable and effective, whether shooting from the bench or prone. 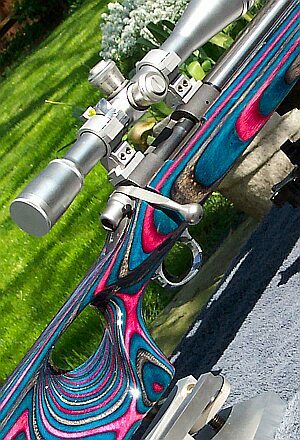 I had seen a combination of colors on one of Bill’s rifles that had been featured on the cover of the June 2000 issue of Precision Shooting. After a long, informative chat with Bill (how I love the famous North Carolina “Good Ol’ Boy” drawl), I had a stock on the way. It wasn’t just any color combination either–it was Bill’s brand new Blue/Wine/Dark Blue/Grey Rutland combo. Bill said it was going to knock my socks off and he couldn’t wait to see a picture of my completed rifle. The $285 Tracker arrived Priority Mail that same week, and when I got a look at it, I knew it would be a winner when we got through with it. The Tracker series stocks come from Bill with the barrel channel, action area, and trigger assembly hole already rough inletted. My task for the night was to make the ejection port, bolt handle, and trigger safety cuts, completely sand the entire stock, and rough out a buttplate from a scrap piece of aluminum. The sanding job started with 400 grit paper and continued all the way down the scale to 1600 grit, prepping the stock for its first coat of automotive clear coat. Bob and I had an agreement, he would shoot the stock with clear coat as many times as I wanted for $40 as long as I did ALL of the wet sanding. So began the dance which saw us meeting at one of the local coffee shops to exchange stories and partially completed gun parts every other day. $40 for painting, $20 for sanding supplies, $5 for coffee, lots of funny looks from folks in the java shack–priceless. We ended up shooting five coats of clear on the stock and after the final coat we took a variable speed drill with a buffing wheel and proceeded to cover ourselves with liquid buffing compound while bringing the finish up to a very, high polish. We assembled the last of the rifle components and the barreled action was bedded with a rough coat of Marine-Tex, sanded, and a skim coat of Acra-glas was applied. Everything was now rock-solid. I decided to mount a Weaver T-36 in the Jewell rings. I got the scope for $295 from a local shooting friend of mine and it would work nicely for the 300 and 600 yard matches. From the first phone call to order parts to the final screw on the scope rings, this rifle took only four weeks to complete. Now it was time to see what it could do. The thing I love the most about the 6BR is its inherent accuracy. It is just a sweet shooting little cartridge in any form. I decided to work up loads with a standard ladder test starting at 28.0 grains of Varget and moving up to 31.0 grains. After the test was complete there were two distinct sweet spots: 28.8 grains and 30.4 grains. Both of these loads produced quite similar results but 28.8 grains gave single-digit ES and SD. Since most of my matches would have 300- and 600-yard courses of fire I wanted the most consistent load regardless of velocity. One of the things any good shooter realizes is there are a multitude of outside forces acting upon our bullets on their way towards the target. By choosing the most consistent load we have a better chance of scoring well in competition, assuming we do our part with wind estimation, proper breath management, trigger control, and follow-through. Considering my 600-yard max distance, I went with the slower load. I figure the target was not going to care whether it was hit at 1864 fps or 1991 fps. I noted earlier that this gun has a .262″ neck. I know this is not very common for a 600-yard 6BR but it was the reamer that Bob had so that’s what we used. I had read about prepping fitted necks on cases so I decided to try it with this rifle. A fitted neck is one that is turned down to just the minimum diameter, .2605″, so that the neck, upon firing, expands and then contracts back to the original size without having to neck-size the case. I sacrificed several pieces of brass, but after a lot of patience I got it right. I also decided to weigh and sort all of my brass and bullets. Out came the scale, zip lock baggies, and NECO concentricity gauge. Many nights were spent in front of the TV, weighing and measuring each piece of brass followed by each bullet. Looking back, much of the success I had with this rifle came from the attention to detail–it removes more variables from the accuracy question. This is the routine I use every time I fire a rifle. I admit, I’m a gripper not a free recoiler. That’s one reason I really prefer the thumbhole stock design. I like to make sure I am in control of the rifle at all times whether shooting from a bench or the ground. I shot my 6BR for the last half of the 2002 season, three matches in all, and won every match. During the final match of the season, October 6th, I shot a new Range Record, the previous record had stood for five years (although I had missed beating it two years prior by one point.) The 300/600 yard record was previously 174 points out of a possible 200, everything that day was in my favor and I shot 99 at 300 yards and 89 at 600 yards for a total of 188. In that season-ending match, Wolcott-made guns swept the top three places, and he was all grins like a proud parent. Shehane’s Thumbhole Tracker stock is really an improvement over the original ST-1000 design, at least for the shooter who desires a stock to shoot from the bench AND the ground. I’ve had one of the original ST-1000’s and they are amazing in their balance and flow over the bags but they were designed from every aspect to be shot from the bench. How the thumbhole improves on this for shooting off the ground is two-fold–relaxation of the forearm and wrist, and improved trigger pull angle. In my opinion, the original was designed to be shot in one of two ways from the bench: trigger pinching with the weak hand, or by the strong hand in standard position with the shoulder an inch away from the buttpad. In both scenarios, nothing touches the rifle except the forefinger and thumb. Being a “gripper” I found that there was no place for my thumb to go while holding onto the rifle because of the relatively large wrist of the ST-1000 stock. In order to shoot in my normal style, I had to use my pinky and ring fingers to support my hand against the palm swell. This placed my trigger finger at a less than idea angle for proper trigger pull. With the addition of the thumbhole, the thumb goes through the opening and brings the base of the palm in direct alignment behind the trigger. In my opinion, this is ideal for a linear trigger pull, which in turn promotes proper technique and follow-through. There would be only one improvement I would make to the Thumbhole Tracker and that would be to add an adjustable cheek piece for prone shooting. After the purchase of some hardware, a few strategic cuts with the band saw, and a lot of time with the sandpaper, the stock would be perfect for prone or F-Class shooting. In no way am I saying the stock can’t be used to shoot prone the way it is, since two of the three matches I won were shot from the prone position–but a cheekpiece would be a nice option. The next stock I purchase will be another Thumbhole Tracker. Whether I add an adjustable cheekpiece is undecided. 1. Most assuredly go with a .269″ – .271″ neck instead of .262″. 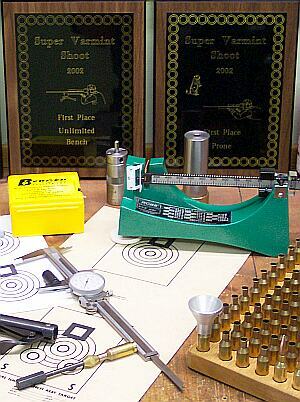 If you have never made fitted cases you need to try it once in your life and then run as far and fast as you can. If you stick with high quality brass like Lapua or Norma there isn’t much neck turning necessary. 2. I will most definitely go with the 6BRX as it can reach the 3000 fps mark easier and without the need for custom dies like the Dasher or Shehane’s 6BRS. 3. Barrel: rest assured it will be a stainless and 1:8” twist or faster. Barrel maker? Time will tell!